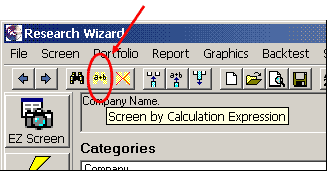 The Research Wizard’s Calculation Expression feature provides extraordinary flexibility, letting the user create his own customized items and ideas. Compare one item to another item. Combine different items together. Even compare and item’s value to its value from a different time period. With over 650 different data items to pick and choose from and up to 12 years of historical data, the possibilities are endless. But what if the items you need to build a calculation with are in different databases? First, let’s look at how to access the different databases with a basic screen. Let’s start by building one together. In the Categories Window, go to Ratings and then the Sub-category, Current. A Screen By Window will pop up. 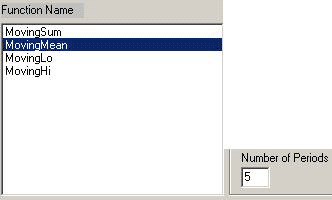 Complete the screen by dropping down the Operator Drop-down box and selecting the ‘=’ sign. And then in the dialogue box to the right, type in a 1 for Zacks Rank = 1. Click Ok, and the item is now added to your Screening Criteria table. 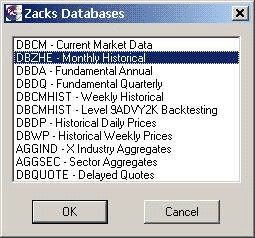 Now let’s say you want to access an item from a different database like the Monthly Historical Database called DBZHE. On your Menu Bar, click on File and then Open Database. 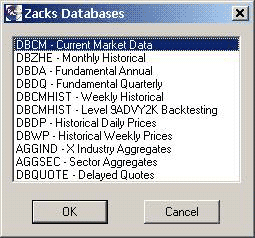 The Zacks Databases Window pops up. Tip: You can always be sure which database you’re in by looking at the upper right corner above the Items Window. It always shows which database is active. 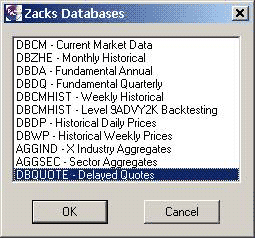 In this example, we selected the DBZHE Database. And that is what’s displayed. Now you can complete the screen by selecting the Category and Item of your choice, just like you would if you were in the main (DBCM) database. In the Categories Window, select the EPS – Earnings Per Share, and then the Sub-category, Surprises and SUE. Then in the Items Window, select the EPS Surprise and then double-click it so the Screen By Window pops up. In the first ‘data’ drop-down box, select Recent. In the next one to the right, select Recent-nQ. Keep ‘Every’ selected in the last drop-down box. Then finish it off by filling in the other boxes as you normally would. Drop the drop-down Operator box down and select >=. See the image below to make sure you did it correctly. Note: The parameter we just created ‘said’: show me the stocks that showed a Positive EPS Surprise in EVERY quarter for the last 12 Quarters. That item is now in our Screening Criteria Table. File on your Menu Bar and select Reset Database. If you want to select a different database, click on Open Database and select the new Database you’re looking for. Now you’re ready to continue building your screen. 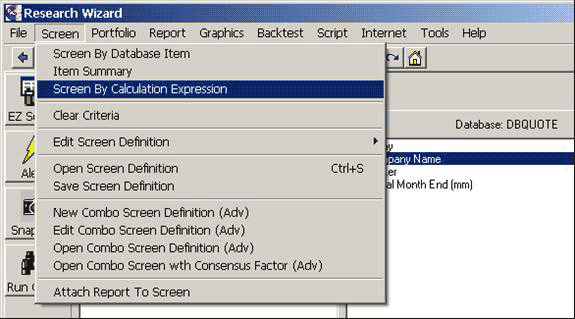 To combine different Database Items in a Calculation Expression works differently. Let’s say I wanted to do something simple, such as screening for stocks whose intraday prices are currently above their 5-day moving average. First, let’s see what the numerical identifiers are for each of these items by going to File, Open Database, and selecting the DBQUOTE – Delayed Quotes Database. Then, go to Screen on your Menu Bar, and click Screen By Calculation Expression. Or Click the fourth button from the left on the Tool Bar as a shortcut. Then identify the item you’re looking for by going to the correct Category and Item. For example, we’re looking for the ‘Last Trade’. So in the Categories Window, select Intraday Price & Volume Data. Then in the Items Window, select Last Trade. You’ll see the number to the left of it reads ‘6’. That means its numerical identifier in the DBQUOTE database is 6. Once you’ve identified the numerical identifier, close that Window by either ‘X’ing out of it by clicking on the X in the upper right hand corner of the Window. Or by clicking the Cancel button at the bottom of the Window. Now let’s go to the other Database we’ll need. Go to File on your Menu Bar and select Open Database. 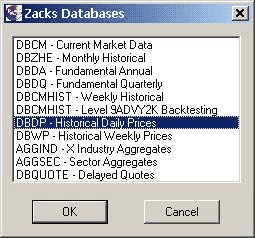 Select the DBDP – Historical Daily Prices Database. Now let’s start building our Calculation. 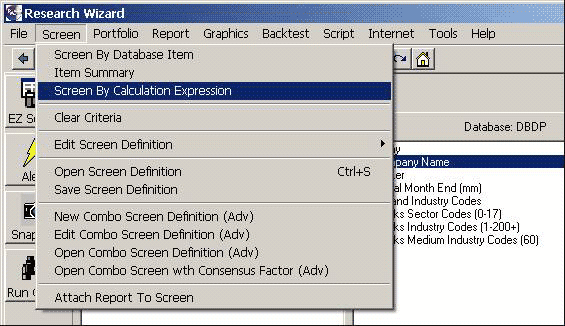 Go to Screen on your Menu Bar and then select Screen By Calculation Expression. Next, let’s add in the other item by going to the Categories Window and selecting Price and Volume Data. Then going to the Items Window and selecting Daily Price (Item # i6). Note: You’ll notice the two different items we want both have the same numerical identifier in their respective databases. 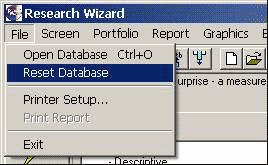 But by putting in the Database’s acronym as a prefix, then a colon, and then lastly the Item Number, the Research Wizard knows exactly what you’re looking for, regardless of what databases you’re in. 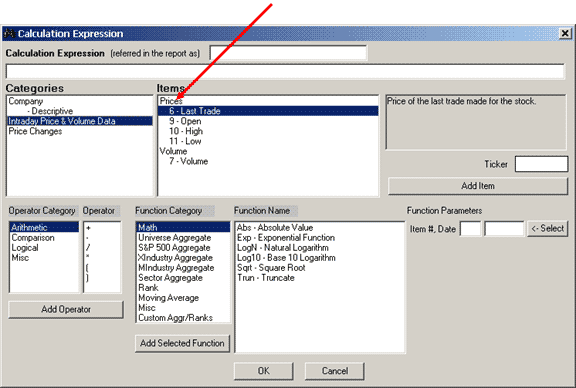 Let’s complete this parameter by going to the Function Category Window and selecting Moving Average. 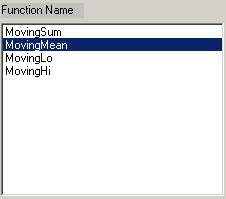 Then in the Function Name Window, selecting MovingMean. Then typing in 5 (for 5 Days/Periods) in the Number of Periods Box to the right of that. In the Function Parameters Section, click the ‘Select’ button, and you’ll see the boxes populate with ‘6’ and ‘Recent’. Next, click the Add Selected Function Button under the Function Category Window, to add that Item to the Calculation Expression. If you did it correctly, the expression in the dialogue box at the top of the Window should look like the image below. Then Click the OK button at the bottom of the Window and your Screening Criteria Window will pop up. Select the ‘=’ Operator, then select 1 = True, and then click OK. If you kept the other Items in the Screen from the previous example, it’ll look like this (below). If not, just the last item should be present. You can continue to build upon this screen or run it. You now know how to access any and all of the items, from any of the databases in the Research Wizard, to build and construct virtually any kind of item you want. It’s fun building screens and researching stocks when you know how to access all of a tool’s features and functionalities. NOTHING can stop you with the Research Wizard.